﻿ Palais Mehdi Marrakech In Marrakech! The Palais Mehdi is a magnificent five star hotel set in five acres of private gardens with orange, palm, jasmine, rose and olive trees. 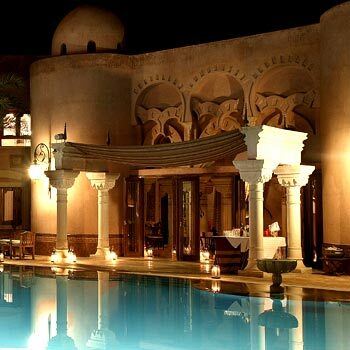 The biggest attraction is the 400 square meters turquoise blue swimming pool, designed in a unique Hispanic Moorish architecture that makes you dream of the oriental world. The steamer chairs, double sun bathing beds, lounging sofas, patio tables and chairs etc surround the pool. There is also an outside bar and barbeque area in its premises. There are classic and superior suites and apartments. The apartments are ideal for families and groups. 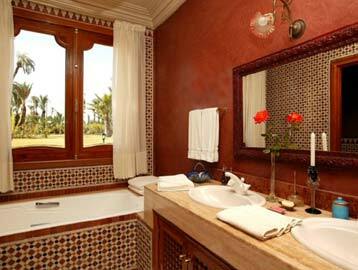 The rooms are spacious and designed in fine shades and colors in traditional Moroccan style to give you a tranquil feel. 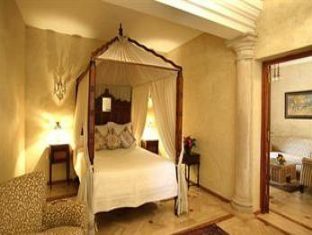 The décor of each suite is unique. There is a sunken bath and a direct way to the pool. The Moroccan cooked food is the best dining experience and you can order any dish of your choice at any place, you like to relish it. The breakfast is also long laid out with pastries, toast, yogurts, cakes, pancakes, waffles, mint tea, coffee etc. There is a large Bedouin tent for parties and other smaller ones for you to use anytime. The staff is extremely friendly and extends help, when required. Their teamwork is great and well planned to make everything very simple.